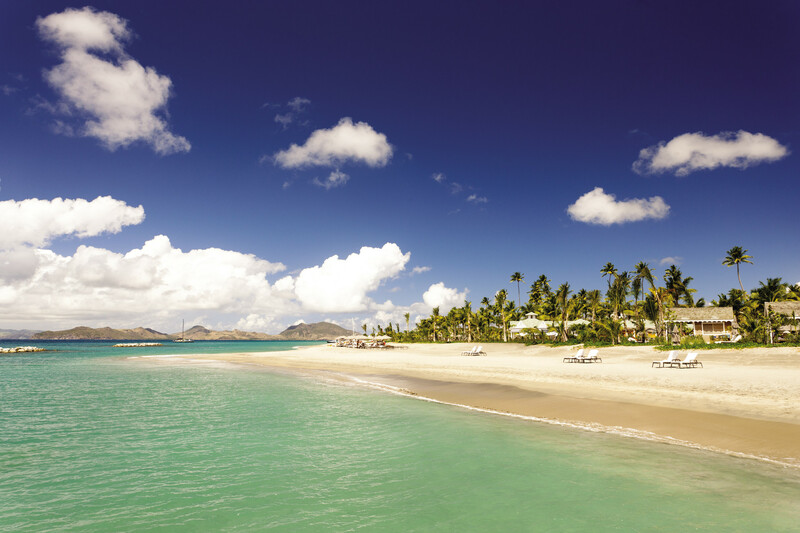 My love of Nevis materialized when I was about to leave Caribbean holidays behind altogether. I was talking to a friend about my indifference to the Caribbean as a holiday destination when he introduced me to this treasure of an island. Over the past twenty years, I had become disenchanted with the indistinguishable resorts and crowded beaches of larger Caribbean islands, but Nevis re-awakened the Caribbean dream for me. I had always heard Nevis mentioned with its larger neighbor, St Kitts, and up until this point, had given it little thought. The promise of an unspoilt Caribbean island and empty beaches led me to reconsider. I swiftly settled on Nevis as the destination for my next trip. Getting to Nevis followed the well-trodden air route from London to the Caribbean, this time I touched down in St Kitts and embarked on the sort of island hopping transfer the region is famous for. With relative ease I found myself in a water taxi arranged by the resort and in less than ten-minutes I could see the majestic silhouette of Mount Nevis across the sparkling water as we approached to land. After settling in, and taking a night to recover from the flight and shift in time zones (personally I always try to push through as late as possible that first night to reset my internal clock), I took half a day to explore Nevis. Being just 36 square miles in size, getting your bearings doesn’t take long. I hired a taxi for the morning, which was inexpensive and my driver, Devaughn, was an extremely competent and knowledgeable guide who was able to tell me a great deal about the island’s history and culture. Having skipped breakfast, I was really pleased when Devaughn stopped by a small roadside grocers called Manzas, near Chrisie Beach where I was able to get some delicious fresh fruit to keep me going. Devaughn also took me to Charlestown, and as it only takes 20 minutes to walk from one side to the other, I decided to explore on foot. Devaughn was more than happy to wait for me. I can only describe Charlestown as authentic. I fell in love with its colorful architecture, the sound of jazz floating in the air and the farmer’s market bustling with people and produce. It’s hard to imagine a more delightful town. For the rest of my time on Nevis, I relaxed into the Caribbean pace of life. It’s practically impossible not to relax when you spend your days ambling along beautiful sandy beaches, occasionally stopping for refreshment in one of the many rustic bars, and stopping to speak to the friendly, welcoming locals. Most startling was just how quiet many of these beaches are, with more fishermen than tourists in some cases. I have always enjoyed chatting to the fishermen on Nevis, as I am a keen angler myself, and extremely interested in the types of fish they catch both from the shore and in deeper waters. On my first trip to Nevis, I remember meeting a fisherman named Alvin who, after sharing fishing stories for around an hour, offered to take me out with a group of his friends to a nearby reef. I’m really glad I took him up on the offer, as we spent the afternoon catching dolphin fish, marlin and kingfish. Of course as a tourist, you always feel like you should offer payment, but Alvin and his friends would have none of it – although I did ensure they all received a few rounds of rum for their troubles! Since that day, fishing has been one of my favorite aspects of life on Nevis, and I always aim to see Alvin and his fishing buddies every time I’m on the island. During my first trip to Nevis I was, and still am, impressed by the plethora of places to dine, which is a blessing to someone who sees cuisine as a key component of travel. My friend’s recommendation had been Rodney’s, an authentic local restaurant serving dishes such as goat water (a type of meat stew) and swordfish, which more often than not has been caught that day; both were excellent and it’s fair to say that I’ve become a bit of a Rodney’s advocate since my first visit. In the higher-end restaurants, dinner is always a fairly relaxed affair with a casual dress code, but don’t let that fool you, many of the meals I have enjoyed whilst visiting Nevis have rivalled the best London restaurants. My impressions of Nevis following my first visit were incredible, and while words cannot do the beauty, culture and friendliness of its locals justice, it’s fair to say just one visit to Nevis reignited my passion for the Caribbean, and this little island in particular. It is definitely worthy of a return trip and I have since been back, I have even started looking at property for sale on Nevis. What is certain is that I owe my friend a favor for such an excellent recommendation.